For the First Time Ever, a Magical Moon Festival Panda With A Shimmering Hologram! Every year, as summer fades to autumn and the air starts to chill, we see things wind down and prepare for winter. Fields are harvested, leaves start to turn and clothing becomes heavier. But, as the days become shorter, it’s a great time to take stock of the past few months -- to be thankful for our friends, family and blessings. It's no wonder why Thanksgiving has such an ideal home in this time of year. A similar feeling also takes hold across China, Korea and Vietnam. Each year, on the fifteenth day of the eighth lunar month, families across East Asia gather for the Moon Festival (also known as the Mid-Autumn Festival). Family members from all corners of the country reunite to give thanks, eat delicious mooncakes, drink cassia wine and pray for good fortune in the year to come. It's also the perfect time of year for the China Mint to release a special Moon Festival Proof as part of their beloved Panda series. Since 2015, this series has astounded collectors with serene, wondrous and adorable one-year-only designs -- and 2017's one-ounce silver proof definitely follows suit with a gorgeous, first-ever surprise! A SIP OF WATER BY THE LIGHT OF THE MOON-- In front of a rippling landscape of hills and fields, the panda of this silver proof's featured design lifts his head after taking a cool drink of water -- all underneath a full harvest moon. To the panda's left, you'll find an inscription that translates to "full moon and full blossom, perfect bliss on Moon Festival." Flip the proof over and you'll discover a section of the Great Wall of China along with the image of an ancient Huntianyi, also known as an armillary sphere, and the "Z" mintmark of China's Shenzhen Guobao Mint. RIPPLING, VIVID HOLOGRAPHIC EFFECT!-- For the first time ever, the China Mint has struck these Silver Moon Festival Panda Proofs with a spectacular holographic effect, providing the panda's pool with incredible light and motion -- and that's just the beginning! PHENOMENAL HIGH-RELIEF PROOFS-- Each Moon Festival Panda is struck in astounding high relief by the Shenzhen Guobao Mint. Beginning as one-ounce planchets of 99.9% fine silver, each proof receives multiple strikes with polished dies to create a concave bowl effect. As a result, the deep, mirror-like fields of each design give the perfect contrast to sharp, frosted features -- providing unbelievable depth and detail. 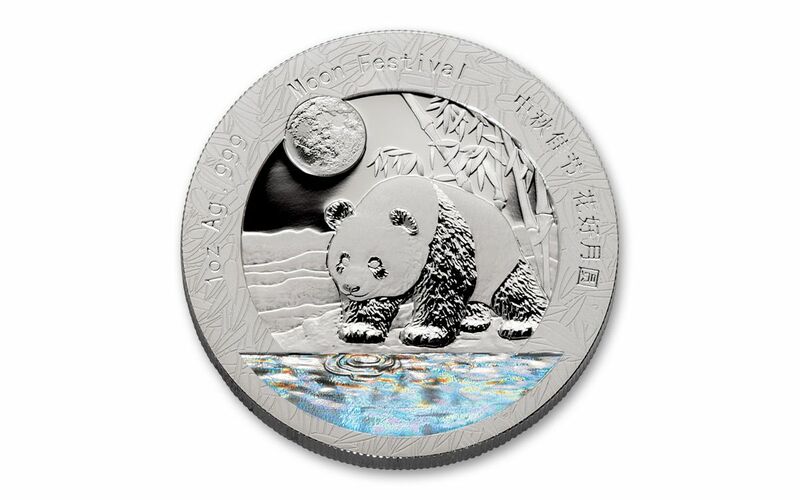 AWESOME EXTRAS!-- Your 2017 Silver Moon Festival Panda Proof will arrive to you sealed in an acrylic numismatic capsule and placed inside a black velvet bag. In addition, your proof will be accompanied by a China Mint certificate of authenticity. AN EXCLUSIVE LIMITED-MINTAGE RELEASE! -- Your proof will be one of only 10,000 produced by the China Mint. 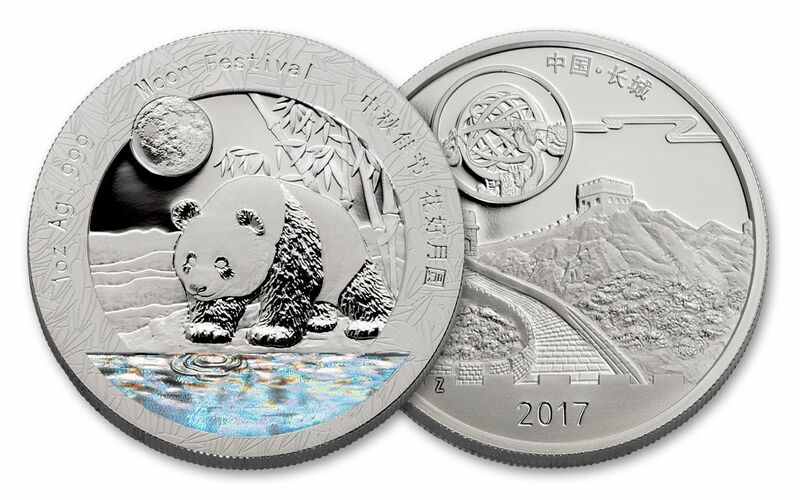 Not only that, but this 2017 Moon Festival Panda is a GovMint.com EXCLUSIVE! That's right - this spectacular proof is available ONLY through GovMint.com. Whether you're a collector of China Pandas or know someone who is, this is a perfect chance to secure a stunning take on a familiar theme. But don't wait -- with this limited amount of proofs spread across countless fans, we're not expecting them to last in our vaults for long. Make a new friend and order your own 2017 1-oz Silver Moon Festival Panda Proof today!